Could you spill the name of the nursery? PM is fine if you're afraid of overwhelming them. Hardly--it's a HUGE place. It's called Clark's Garden & Stone and it's actually in Lynwood, IL. Website is http://clarkesgardencenter.com. They should still have plenty of inventory. It's nearly time for harvesting the cherries (my tree goes off before they do in Michigan). Anyone willing to help can keep what they pick (seriously). Warning - 1) there may be Cherry Fly Worm, and 2) I have 2 dogs. OTOH the worms are small, and mostly made out of cherry. I am going to start picking tonight, I think. I don't know what your schedule is but Friday, Saturday, Sunday - all in the afternoon? I also have a good pitter, and find it's easier to pick for an hour, then pit for an hour, than to build up too many cherries and have to pit for hours and hours. Last year I picked for a week straight, going for about 45 min- 1 hour each time, but I'm probably pretty inefficient. I think there are fewer cherries this year. So far, lettuce and basil are bumper crops (usually I can't get basil to grow much at all). Gai Lan (chinese broccoli) is bolting somewhat, but I keep cutting off the flower heads (and eating them), and with the recent rains, the stems are thickening up nicely, and lots of tasty leaves. Tuscan kale does not seem to germinate well, but it's growing. I've got one big jalapeno ready for me to pick, and a lot of little nubs. Lots of flowers on the tomatillos, I haven't noticed any fruit set yet. Snap peas are not progressing much: lots of flowers, few pods. Last edited by JoelF on July 2nd, 2014, 1:33 pm, edited 1 time in total. Great and inpsiring photos, boudreaulicious, thanks for posting them! Thanks Katie--I'm enjoying both the garden AND the much-easier photo posting process of the new and improved LTH!! What kind of pepper is that, in the second picture, from the A Few More post?? I tried to quote it and copy it but I can't get the picture into this reply. Anyhow, the reason I ask, is, I picked one off my Jalapeno plant the other day that looked just like that. 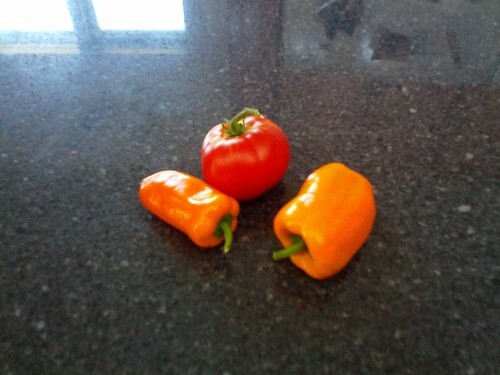 I wondered if it was deformed, or if I got an oddball pepper plant mixed in with my Jalapeno's. Shishitos--my absolute favorite. I asked my guy at the garden center I get most of my seedlings at if he'd heard of them last year and he remembered and grew them for me this year. I was pretty psyched when I saw them and they've done really well already and are loaded with blossoms. Blistered on a cast iron skillet on the grill, sprinkle of salt and pepper--so delicious!! Definitely not a jalapeño. Generally not that spicy although you'll get hot ones mixed in. Mine are full of blossoms too. I only had one pepper on that plant though. The rest of the plants all had at least one Jalapeno on them, so I know they are right. I'll try to cook them up as you suggest, when we get a few more, maybe they will get their own row in the garden next year..... always good to try new things. Look forward to hearing what you think!! boudreaulicious wrote: Shishitos--my absolute favorite. I asked my guy at the garden center I get most of my seedlings at if he'd heard of them last year and he remembered and grew them for me this year. I was pretty psyched when I saw them and they've done really well already and are loaded with blossoms. Blistered on a cast iron skillet on the grill, sprinkle of salt and pepper--so delicious!! Definitely not a jalapeño. Generally not that spicy although you'll get hot ones mixed in. I'll definitely consider shishitos next year -- an abundance of jalapenos is only moderately useful, but I can certainly put a bushel of shishitos to good use at a single party, and at $15/lb at the grocer, it's a good value to grow yourself. They're considerably cheaper than that at Asian grocers and they are very light so you get a bucketload to the pound. But I love being able to go out and grab a bunch and grill them up fresh--can't buy that at the store. Plus they're very prolific for a pretty small plant. So happy to have them this summer!! I grow Shishitos from seed. This year the bunnies munched on the first set of leaves so the plants are a bit behind. Should have boatloads by August. I had to move at the beginning of June, so I didn't plant in the three boxes I built for last year's garden. At the last minute, I was given a space at the community garden just down the block from me, so I decided to see if I could pull up the boxes and bring them. We shoveled the dirt into a few garbage cans and brought that, too. But this is really, really late to be starting a garden. All I have in there are a few tomatoes (cherry and slicers), a jalapeno, a bed of kale (Russian flat and Scotch curly), a zucchini, a pattypan, a cucumber, and a bell pepper. I've also got basil, tarragon, oregano, dill, thyme, mint, rosemary, Thai pepper, and cilantro, mostly in pots on my back deck here in the new apartment. I might build one more box for the community garden and grow some greens. I'd put up a photo but my plants look so measly compared to the above shots! Hi- You can still plant carrots, Japanese turnips, green onions, and beets in your garden, and then in another month you can plant lettuce and spinach and peas. I love Japanese turnips. I get the seeds from Johnny's in Maine. That is where I get most of my seeds, and I love that company. They have a clearance sale going on right now, where they have some stuff for $1 a packet. Anton's also sells some veggie plants in August too that they start in June. They have some greens, lettuce and broccoli and a few other things that they sell. They are located at Pitner a few blocks South of Dempster between Dodge and McCormick. I plant lettuce throughout the summer--if it gets super hot, I just cut it and throw in more seeds. I do the same with peas. Sorrel is my new favorite green this year. Grows like a weed and does not appear to be negatively affected by the heavy rain or fluctuating temps. I ordered the seeds on Amazon. I had some fungal issues with a couple of my tomato plants so grabbed a couple of new ones at Alsip Nursery and planted them yesterday--I'm sure they'll do fine. It may be "too late" for in ground farming of some things but for raised bed/containers, you really should be fine unless winter comes early. I was going to tell you how cool your balcony farming operation was the other night, then I got sidetracked by the Shisito Pepper. I don't know of any farmer that doesn't have the passion to do it. It's not a job that you do for money, the hours are long, investment is huge and sometimes the return is negative. The weather can lure you along, all season, then kick you in the teeth right before harvest. After a bad year, you wonder why you even bother, then after the shock wears off, you start looking forward to next spring, because it could be the best year ever. You have that passion, your way to fulfull the desire is a little unconventional (to me anyway), but you have it. It won't be long before you throw away the pots, and fill that whole balcony with dirt, right up to the rail. I don't know how you'll get a tractor up there, but you'll find a way. Is your corn shooting tassels yet?? I know we planted kind late but our tomatoes and cucumbers show no fruit yet...getting frustrated. Rabbits have eaten our green beans and the first leaves of our cabbage. Parsley, celery, and herbs are doing great. Rabbits (probably) or something else has eaten all our Swiss Chard and Kale. Tomatoes are still green; we're hoping to harvest them before the squirrels take one bite and then mockingly leave the remainder of the tomato in plain sight on top of the fence. Hi- With all this cold weather we have been having this summer everything is slow. I've picked lettuce, green onions, peas, basil and a few Sun Gold cherry tomatoes so far this year. In another week I should have lots more Sun Golds which I love, and a few Juliet baby plum tomatoes, but all my larger tomatoes are at least a few weeks coming, and my one Brandywine plant is probably going to take a month or more before I get any tomatoes. Hopefully the Black Krim and Japanese Black Trifele will ripen in 2-3 weeks, and I'll have one or two Black Cherry tomatoes in a week. There have not even been many decent heirlooms at the Evanston farmers market yet, and the ones that I have seen are at least $3 a pound. Even the conventional ones are $3 a pound right now.